a tumor arising from cell rests derived from Rathke's pouch or some other part of the pituitary gland, often destroying the gland and causing deficits of the pituitary hormones. A suprasellar neoplasm that may be cystic; develops from the nests of epithelium derived from Rathke pouch; the histologic pattern, similar to that observed in adamantinomas, consists of nesting of squamous epithelium bordered by radially arranged cells; frequently accompanied by calcium deposition; may occassionally have a papillary architecture microscopically. /cra·nio·pha·ryn·gi·o·ma/ (kra″ne-o-fah-rin″je-o´mah) a tumor arising from cell rests derived from the infundibulum of the hypophysis or Rathke's pouch. a congenital pituitary tumor, appearing most often in children and adolescents, that arises in cells derived from Rathke's pouch or the hypophyseal stalk. The lesion, a solid or cystic body ranging in size from 1 to 8 cm, may expand into the third ventricle or the temporal lobe and frequently becomes calcified. The tumor may interfere with pituitary function, damage the optic chiasm, disrupt hypothalamic control of the autonomic nervous system, and cause hydrocephalus. Increased intracranial pressure, severe headaches, vomiting, stunted growth, defective vision, irritability, somnolence, and infantile genitalia are often associated with the lesion in children. Development of the tumor after puberty usually results in amenorrhea in women and loss of libido and potency in men. Also called ameloblastoma, craniopharyngeal duct tumor, pituitary adamantinoma, Rathke's pouch tumor. Neurology A benign 1º pituitary tumor that is often functionally active, secreting ↑ pituitary hormones–eg, hGH, causing gigantism–if prepubertal and acromegaly—in adults; they comprise < 5% of brain tumors of children Clinical Changed vision, headache, weight gain Treatment Surgery + RT. See Histologically benign. A suprasellar neoplasm that develops from Rathke pouch; the histologic pattern consists of nesting of squamous epithelium bordered by radially arranged cells. A brain tumour affecting mainly children and arising from persistent primitive cells in the region of the pituitary gland. It causes headaches, visual field loss and delayed physical and mental development. Treatment is by surgical removal. A tumor near the pituitary gland in the craniopharyngeal canal that often results in intracranial pressure. Martin H., German anatomist, physiologist, and pathologist, 1793-1860. Rathke fold - two fetal folds of mesoderm. A suprasellar neoplasm that develops from the Rathke pouch. n a tumor histologically identical to ameloblastoma that arises from remnants of the craniopharyngeal duct. a benign tumor arising from the cell rests derived from the infundibulum of the hypophysis or Rathke's pouch. Usually seen in young animals, they grow slowly. Their effects may be seen as a hypopituitarism, cranial nerve deficits or central nervous system dysfunction. 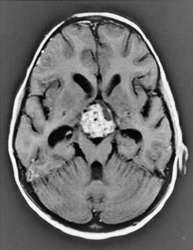 Approximately, half of all intracranial neoplasms in children are gliomas; 15% are Primitive neuroectodermal tumours including medulloblastoma, ependymoma and craniopharyngioma account for about 10% each. Rest of the tumour categories were peripheral nerve origin tumours, pituitary tumours, craniopharyngioma, embryonal tumours, chordoma and metastasis. Comparative Immunohistochemical Assessment of Craniopharyngioma and Related Lesions. Tumor n Craniopharyngioma 8 Meningioma, grade I-II 59 Glioblastoma 60 Astrocytoma, grade I-II 35 Astrocytoma, grade III 7 Ependymoma, grade I-II 14 Ependymoma, grade III 3 Oligodendrogliomas, grade II 7 Oligodendrogliomas, grade III 1 Mixed glioma (oligoastrocytomas), grade III 3 Carcinoma (metastatic) 20 Medulloblastoma 18 Lymphoma 3 Schwannoma 3 Choroid plexus papilloma 6 Central neurocytoma 4 Primitive neuroectodermal tumor (PNET) 3 Atypical teratoid/rhabdoid tumor 4 Hypothalamic hamartoma 3 Table 4: Cases in which there were discrepancies between the frozen section report and the final diagnosis (based on permanent section). The goal of this research was to determine the degree of recovery of visual acuity after surgical treatment of craniopharyngioma by decompression of optochiasmal region. These findings suggested a cystic craniopharyngioma (Figure 1). 27, 38-40) More recently, BRAF mutations have been identified in papillary craniopharyngiomas. Chan M, Herrera SR, Neckrysh S, Wallace A, Valyi-Nagy T, Charbel FT, Primitive neruoectodermal tumor after radiation therapy for craniopharyngioma, Neurosurg Focus, 2011,30. Abid Saleem spoke about role of Gamma Knife Radio surgery in Multimodality Management of Craniopharyngioma. Anthony Figaji, Head of Neurosurgery at the RCWMCH, spoke on the neurosurgical management of craniopharyngioma, one of the most difficult problems facing a paediatric neuro-oncology MDT. We conducted a retrospective study to evaluate outcomes in patients with a craniopharyngioma who were managed via a transnasal transsphenoidal approach. Iona in 2007 with IONA was diagnosed with a craniopharyngioma brain tumour.